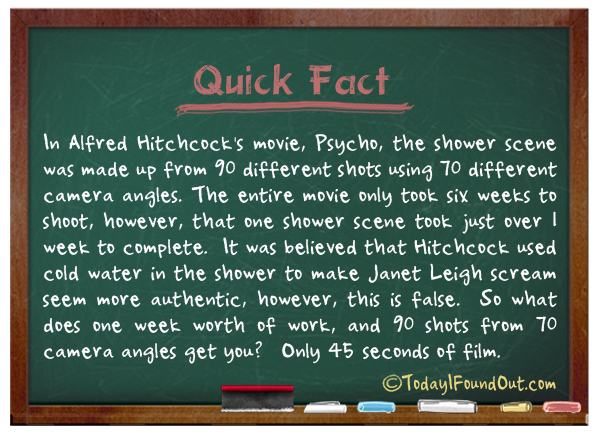 In Alfred Hitchcock’s movie, Psycho, the shower scene was made up from 90 different shots using 70 different camera angles. The entire movie only took six weeks to shoot, however, that one shower scene took just over 1 week to complete. It was believed that Hitchcock used cold water in the shower to make Janet Leigh scream seem more authentic, however, this is false. So what does one week worth of work, and 90 shots from 70 camera angles get you? Only 45 seconds of film.